We want you to enjoy your PREMIUM motorcycle leather for years to come! 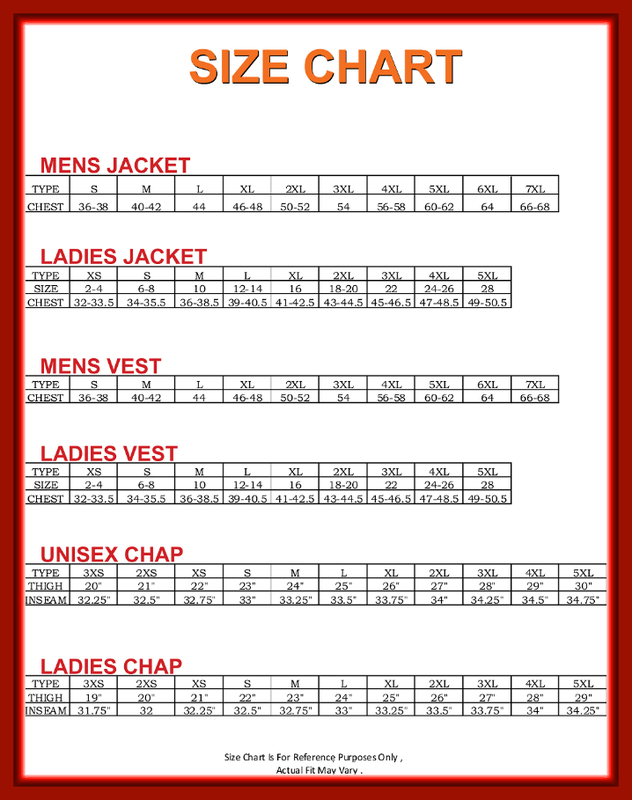 That's why we provide you with these quick and easy tips on sizing your leather vest and jacket. Take a peek! Using a flexible tape measure, measure around your chest at about 2' below the bottom of your armpit. Whatever measurement you are, add 4 inches. EXAMPLE: If your chest is 48" around, you would wear a minimum of a size 52 coat. If you are portly or have a large stomach, add another size up. Just remember that the larger the coat, the longer the sleeves will be. However, the main thing is to choose a size that will zip up around your abdomen. Note: All riding jackets have longer sleeves than a bomber or fashion jacket. This keeps the wind from going up your armpit and is normal. For measuring chaps: Using a flexible tape measure, wind it around the largest part of your thigh to measure your inseam. Allow a little bit of room for sitting down as well. Content Copyright 2018 Maggie Valley Biker Wear LLC.